A psychiatrist visited a California mental institution and asked a patient, "How did you get here? What was the nature of your illness?" He got the following reply. "Well, it all started when I got married and I guess I should never have done it. I married a widow with a grown daughter who then became my stepdaughter. My dad came to visit us, fell in love with my lovely stepdaughter, then married her. And so my stepdaughter was now my stepmother. Soon, my wife had a son who was, of course, my daddy's brother-in-law since he is the half-brother of my stepdaughter, who is now, of course, my daddy's wife. So, as I told you, when my stepdaughter married my daddy, she was at once my stepmother! Now, since my new son is brother to my stepmother, he also became my uncle. 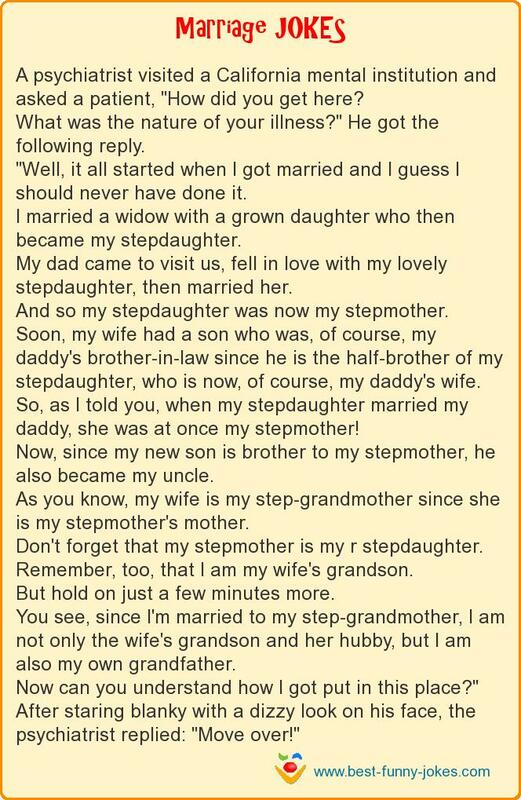 As you know, my wife is my step-grandmother since she is my stepmother's mother. Don't forget that my stepmother is my r stepdaughter. Remember, too, that I am my wife's grandson. But hold on just a few minutes more. You see, since I'm married to my step-grandmother, I am not only the wife's grandson and her hubby, but I am also my own grandfather. Now can you understand how I got put in this place?" After staring blanky with a dizzy look on his face, the psychiatrist replied: "Move over!"